An in depth look at how the Manhattan office space market has fared in 2015 and forecasts for this coming year. Over the past 12 months, federal economic policy has been focusing on expansion, driving an increase in employment rates, especially as far as office-based employment is concerned. This type of employment grew by 2.6 per cent in just 1 year, and prompted a considerable increase in demand led by occupiers in the Manhattan financial services sector. In certain Manhattan sub-markets (such as in Midtown South), strong demand from tenants in the TAMI sector (technology, advertising, media, and information) was also evident. At the end of 2015, total office stock in Manhattan was just under 395 million square feet, of which 28 million were vacant. Total transaction volume amounted to more than 28 million square feet, one of the highest figures of the past 10 years. However, there was a slight decline in transaction volumes in downtown Manhattan, where transactions mostly involved small and medium-sized office properties. 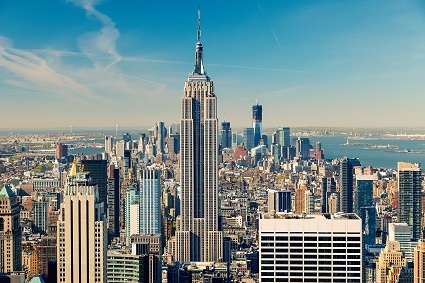 During 2015, office vacancy rates in Manhattan went down from 9.3 per cent to 8.5 per cent. This decrease equals to 90 basis points on a year-on-year basis, and brings vacancy rates closer to Manhattan’s historical average of 8.9 per cent. In Midtown South, vacancy rates were markedly lower at 6.2 per cent, whereas in downtown Manhattan they went down by 30 basis points to 9.4 per cent. Absorption levels were consistently high at 4.5 million during the last quarter of 2015 alone (3.5 million of which involved Class A office space). There were evident spikes in transaction volumes in areas like Park Avenue, Penn Station, and towards the southern end of Times Square. Average asking rates increased by 5.7 per cent to $71.58 / square foot, up from $67.70 the previous year. Rental rate increase was also significant for Class A rents, which grew by 4.2 per cent with respect to 2014 and reached average values of $76.76 / sq ft. Downtown Manhattan and Midtown South (the latter being a particularly tight market) experienced marked rental growth, as average asking rents in these sub-markets grew by 2 per cent over the past 12 months. The highest rents for all office space classes are in Madison / Fifth Avenue, where they average $98.29 / sq ft, followed by properties in Park Avenue ($96.90), SoHo ($88.28), and Sixth Avenue / Rockefeller Center ($79.37). At the other end of the scale, the lowest priced office space in Manhattan is found in Financial West ($49.73), Financial East ($52.92), Midtown Insurance ($54.22), and United Nations ($55.39). Similar trends can be observed as far as Class A office space is concerned, since the most pricey office properties are in Madison & Fifth ($103.45 / sq ft), Park Avenue ($96.90), Times Square South ($93.85), whereas the lowest prime rents are clustered around Financial East ($55.61), Financial West ($52.35), Insurance ($57.85), and Penn Station ($61.47). During 2016, growth is anticipated in the Manhattan office market with regards to rental rates, leasing activity, and transaction volumes. This will be mostly driven by the availability of newly released office space, since according to market analysts at Cushman & Wakefield, at the end of 2015 there were 12.1 million square feet under construction in Manhattan. Up to 11 new developments will be delivered by the end of the year, especially in sub-markets like Penn Station, the World Trade Center, Park Avenue, Grand Central, Hudson Square, West Village, and Chelsea. Occupier demand in these areas is expected to rise significantly over the next 12-15 months. Moreover, during the next 12 months we can expect to see an increase in leasing activity across Manhattan, driven by ongoing job creation in key office-based sectors like banking and finance. Lastly, average rental rates are expected to increase during the remainder of the year, especially for properties located in new office buildings, whose asking prices may be as high as $160 / square foot. This entry was posted on Wednesday, February 17th, 2016 at 9:24 am	and is filed under Manhattan, New York, Trends and Statistics. You can follow any responses to this entry through the RSS 2.0 feed. You can leave a response, or trackback from your own site.